Alexander Creswell’s most recent sketches and paintings from his travels around Jerusalem and Petra will be exhibited at Watts Contemporary Gallery from 27th April 2019 – 9th June 2019. Free admission. To book tickets for Alexander’s talk The Architecture of Faith in Watts Gallery on 15th May 2019 click here. Paintings in the exhibition can be viewed here. 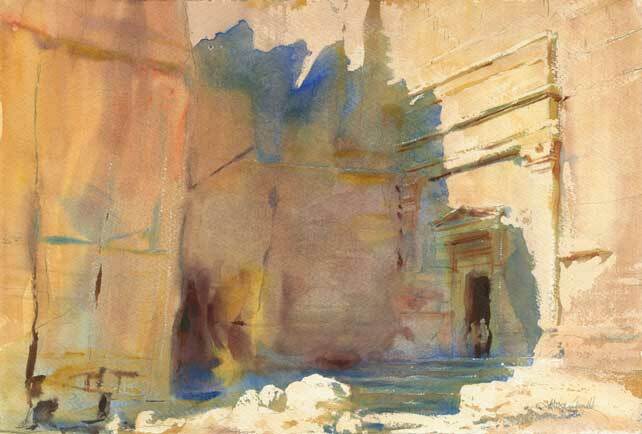 This spring, Watts Contemporary Gallery will present an entirely new body of work by renowned watercolourist, Alexander Creswell, made during his recent travels in the Holy Land. For the first time, Journeys in the Holy Land: Alexander Creswell will show 30 new paintings in Creswell’s distinctive, light-infused style, depicting the region’s sublime landscapes and architecture. Returning to Watts Contemporary Gallery after two successful exhibitions here and his instalment as G F Watts Associate Artist 2009-2011, Creswell renders scenes from the Holy Land with characteristic draughtsmanship, employing light and darkness as his muses, and the patina of stone and earth as his palette. A favourite artist of, and previous co-exhibitor with, HRH The Prince of Wales, Creswell exhibits regularly to critical acclaim. As with all Watts Contemporary shows, all paintings in this exhibition are for sale. Inspired by the textures, patterns and vistas he encountered, and the ways their form is animated by the heat and changing light, Creswell has created a series of paintings closer to abstraction than anything he has made before. ‘It was like learning a new language with which to describe the spirit of place’, he writes. But one defining feature remains: as with previous bodies of work, it is the collision of human ingenuity with the forces of nature that runs vein-like throughout Creswell’s paintings, connecting each new project under an overarching investigation of man’s relationship to the earth. In the rock-carved architecture of Petra and the topography of Jerusalem, Creswell finds a serene beauty: capturing moments redolent with humankind’s collective history, where the natural world meets the man-made in the play of sunlight upon stone. ‘I have been bewitched by this dichotomy throughout my work’, explains Creswell, ‘from derelict stately homes, [to] burnt-out castles, classical ruins and war-ravaged cities’. Impermanence, Creswell’s paintings seem to tell us, is inevitable, even natural, marked only by our ability to ‘[record] it all in art, literature and music’. Alexander Creswell has been likened to JMW Turner RA and to David Roberts RA, but his fluency with light is quite his own. He has long taken inspiration from the energy and excellence of work by G F and Mary Watts, and, with his home and studio in Surrey, has been a regular visitor to Watts Gallery since childhood. As G F Watts Associate Artist 2009-2011, Creswell was the first artist to occupy Watts’s Studio since G F Watts lived and worked there. In 2018, Creswell completed a study of Westminster Abbey – the first by an artist in its long history – which was exhibited at the Abbey and published as a book, Glimpses of Eternity. All of Creswell’s 35 paintings and sketches were acquired for the Abbey Collection. Other commissions include Windsor Castle after the fire in 1992 and accompanying book, Out of the Ashes; The Royal Collection, HM Queen Elizabeth II; interiors of the Frick Museum in New York; and the Keller Ceiling in New York, which was the first figurative ceiling painting to be undertaken and installed in decades. Alexander Creswell exhibits regularly in London, Dubai and New York.